I love the color in this cement tile floor. Notice how the cement tile pattern blends similar colors to create a simpler pattern? If you're having trouble finding the right color, design or pattern, then these cement tile design trends may provide the answer you were looking for. If you're new to cement tiles, then these trends are the perfect designing tips for you! Tip #1: Strong patterns can be "softened" with the use of similar colors that help blend a design together. Tip #2: Bold patterns can be softened with the use of muted colors. Patterns will be less commanding if you use muted colors like this customer did with our Zebra pattern in B Colorway. Tip #3: Geometric patterns using straightforward palettes with two or three colors are a great way to introduce cement tile and a bold splash of color into your home. It's also a strong design trend as homeowners, architects and designers consider cement tile for floors and kitchen or bathroom backsplash. After returning from Coverings 2012, I was so ecstatic about the use of color in the tile I saw that I couldn't wait to get home so I could blog about it (see Tile Trends from Coverings 2012). For the first time in a very long time, I saw the use of color and color tile on the show floor. I'm thrilled to report that the trend continues from what I saw recently during Coverings 2013. Despite an extensive palette of more than 80 colors, I'm finding there is a strong design sense to use grey tones in cement tiles. In fact, Avente just submitted samples of Dark Shadow, Ash Grey, Grey, and Pewter for a new restaurant that will require more than 1,000 square feet of tile! I guess this shouldn't come as a big surprise. Interior Designer and go-to color maven, Lisa M. Smith, recently explained, Black, White & Gray – The New Fall Interior Palette. 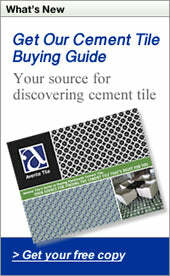 Subtle and complex grey tones are popular color choices for cement tile. The other strong trend has been the increased use of steel blues or gray-blues. The rendering below shows the final design and colors of the cement tiles destined for a New York City hotel. Tip #4: Use colors in the pattern that already exist in your home. Avoid bringing in new colors just because you like them. Cement tiles are not confined to just a rectangular format. Their strength and durability easily lend themselves to the geometric, Moorish-inspired Arabesque cement tile patterns. Customers gravitate to the natural red, brown, and terracotta bisque colors these tiles adroitly mimic. However, the gray colors from this palette are a popular choice, too. Tip #5: A different format or shape in just one or two colors will provide interest and subtle texture. Have a Question? A tip you'd like to share? Do you have a favorite cement tile tip or nagging question? Contact us or leave a comment. We'd love to hear from you! If you love tile, you'll enjoy Tile Talk. The newsletter provides information on specials, tile tips, design ideas, and new products. Don't delay! Sign up now to receive our free monthly newsletter via email. 1. How and when did you start creating your tiles? 2. As an artisan, what inspires your creations? Lilywork owners gain inspiration from travels, pulling ideas from architecture and cultures across Europe and the Near East. 3. Now, of the many designs and projects, which stands out as your favorite? Why? One of our favorite recently completed projects is a residential backsplash. It is a traditional space in a historic home using Lilywork field tile in the herringbone pattern. It also incorporates one of our more interesting textured field tiles, Bosphorous, and three-dimensional rosettes into the focal area. We were able to work more closely during the backsplash design process for this project. 4. What was the proudest moment for you and your hand-made tile business? One year ago, this past April, we both began to work exclusively for our own company. It is something special to look back at what had been built from the ground up and now could sustain us, especially during a time when the economy was uncertain. 5. In promoting your creations, and to help gain greater exposure, which digital platforms do you use (Blogging, Facebook, Twitter, Pinterest, Instagram, etc.)? How do you use them to promote your hand-made tile business? Facebook has been helpful for showing studio process shots. It is invaluable for designers, dealers and prospective clients to see and understand the hand-made process. 6. Which of these social media platforms has helped your business the most? How? We self-promote via our website, and Facebook, which have been useful tools for people familiar with our business to further explore our products and concepts. Houzz has introduced our business to a wider market not yet familiar with Lilywork. 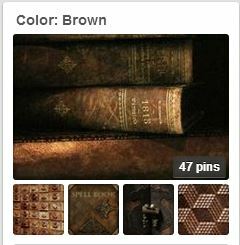 We would like to work more with Pinterest, as time permits. 7. Where do you see the company going from this point forward? Lilywork recently moved to Stonington, CT, and we look forward to working locally, and direct to the trade in our new location. Traditional Gran Cordoba Cement Tile Polished 8"x8"
When a customer requests a special size for their handmade cement tiles, we are more than happy to assist in meeting their design needs and special requests. 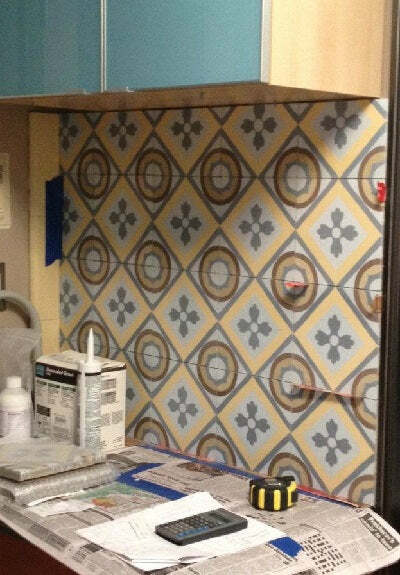 In this case, the customer needed an 8"x8" tile size of the Gran Cordoba Cement Tile pattern for their residential hall and bath. 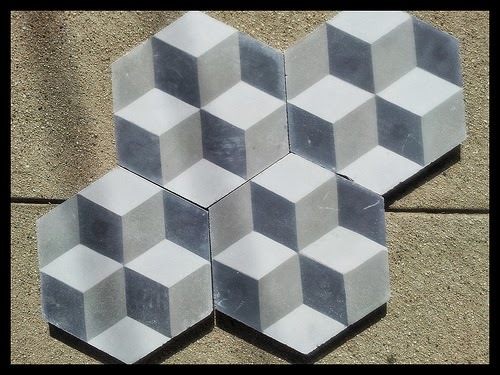 Because this pattern is only available in a 10"x10" format, the cement tile factory created a custom 8"x8" mold. Of course, there was an additional charge for creating a new mold; however, the customer didn't mind the extra charge if it meant they would achieve their design goal. Further, rather than spending additional money for the border and corner molds, the customer chose the Cuban Heritage Design 250 Handmade Cement Tile 8"x8" Border and Corner Pattern to use with the field pattern, Gran Cordoba. The customer used the Heritage Pale Green solid color tiles to fill the area outside of the rug. They also purchased strike-off samples of the border, pattern and corner to ensure color placement and design. You can see the entire process, from concept, design, and installation, on our Houzz Gran Cordoba - Luscen Custom Handmade Cement Tile Project entry. How can we help you with your design needs today? 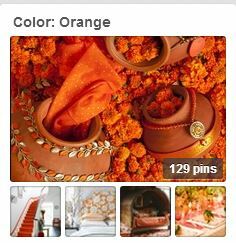 Our Pinterest board selection for this month was inspired by the upcoming change of seasons where Summer will soon graciously give way to welcomed breezes, crisp air, and the richness of Autumnal hues such as yellow, orange, red and brown. Together with this seasonal change, our collection of Leaf Imprint Ceramic Tiles offers the perfect companion to all that nature offers. 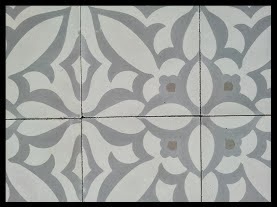 Due to increases in our costs, we must raise the price on many of our hand painted ceramic and cement tiles. We have not increased prices in over four years. The price increase is necessary for us to continue to provide the quality tiles and customer service you expect. We have avoided raising our prices for as long as possible, but we can no longer prolong the inevitable. The new prices will be shown online and go into effect on September 14, 2013. The lines that will be increased are shown below. We will honor the current prices for any orders placed between now and September 13, 2013. Take advantage of the lower prices now if you were considering a purchase. We thank you for your business and appreciate your understanding. The following tile lines will be have new prices effective Sept. 13, 2013. Let's face it, not everything goes right 100% all of the time. Even a well-planned project may encounter problems that nobody expected. Nevertheless, it is always better to be prepared and know what problems to expect. 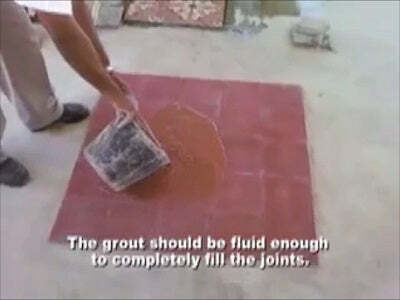 Today, I discuss grout haze – a problem that often occurs with both ceramic and cement tile installations. I’ll explain what grout haze is, how to correctly identify the problem, and why it occurs. 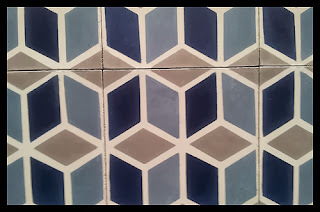 However, today’s post focuses exclusively on how to remove grout haze on cement tile installations. Applying sealer to a floor that is not clean. The floor wasn't clean when the penetrating sealer was applied and the sealer carried debris, dust, pigment and grout into the crevices. Efflorescence. Efflorescence or the formation of salt deposits as water evaporates or leaves from the lime and calcium found in concrete. This problem is usually mitigated with the application of a penetrating sealer since water can no longer pass. 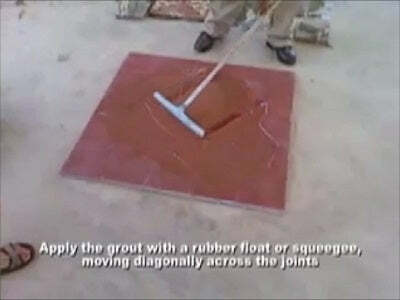 Quickly remove excess grout with a float and sponge, before it begins to dry. These same best practices are shown in the steps below. Following these steps are the best way to avoid grout haze; but, they alone can't guarantee success. 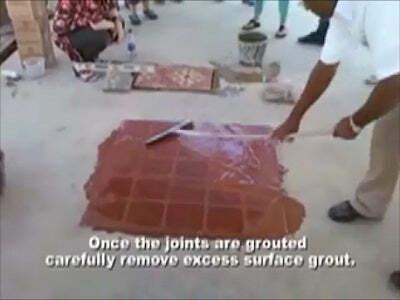 We also have a great video demonstration on Grouting Cement Tile. 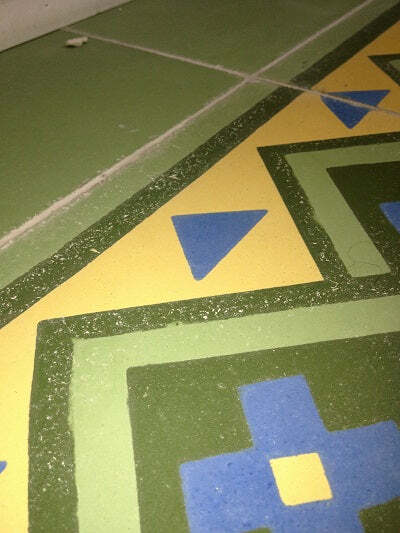 What Causes Grout Haze in Cement Tile Installations? Grout haze is created by residual minerals left after water has dried from grouting. Remember that grout haze is caused by grouting and is a normal part of tiling. Grout is made of minerals and cement mixed with water. During the installation, the tile is entirely covered with grout because you need to smear grout across the tile. If the grout becomes slightly too dry or dry during application, it can penetrate the cement tile pores. The haze will become apparent after the water on the tile surface evaporates and leaves behind the minerals from the grout. 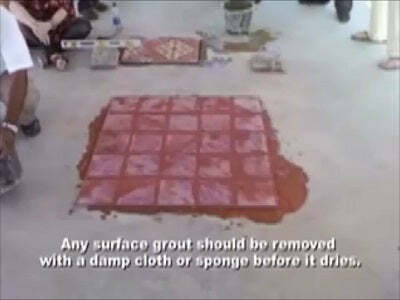 Remember, the grout is applied between the spaces of tile using a tile float, and then wiped away with the same tile float and a wet sponge. The photo below shows some grout haze. The grout haze is the chalky white specs on the dark green and dark blue. First Rule: Don't panic. If the haze is caused by grout, and not efflorescence, it will often disappear with frequent mopping. Grout may stubbornly adhere to cement tile pores; but, with enough water and elbow grease, it will release. In general, avoid grout haze removers because they are slightly acidic and will damage the tile. I have no experience with such cleaners. Here is what I usually recommend. These guidelines apply only to cement tile installations. Start with a Light Buff & Clean. Buff the floor with a floor polisher and white pad. Use just a bit of water and change the pads frequently to encourage the clean-up of any grout. If you don't achieve the results you are looking for, attempt a Deep Cleaning. A deep cleaning is achieved by buffing the floor with a floor polisher and green pad using a lot of water and pH neutral soap. This must be done prior to applying a penetrating sealer. The goal is to really clean the floor of any dust, grout, pigments or debris prior to sealing. The use of a floor polisher and green pad isn't usually necessary on polished tiles. Polished cement tiles are "buffed" at the factory to achieve a satin sheen that simulates the look the tiles acquire after years of normal use and care. The surface of a polished tile is smooth compared to an unpolished or raw cement tile. The smooth surface of a polished tile makes it easier to install because grout is less likely to penetrate the tiles. In locally severe locations, use 800 grit wet sandpaper and water to remove excess grout. It gets down to this. Cement tile is fairly easy to clean with a floor buffer or rags, water, soap and elbow grease. Occasionally, fine grit wet sandpaper may be required to remove excessive deposit of grout. Protect cement tile from oil and acids that will severely damage it.